The Veolia Water garden, demonstrates inventive ways to conserve water and achieve a beautiful garden during times of drought. Inspired by William Wordsworth’s poem, The Fountain, the garden depicts a Cumbrian landscape, complete with a grazing meadow, fountain, stream, a stone well and a rustic crofter’s hut. The garden includes drought tolerant plants that are most likely to withstand a dry summer as well as drought tolerant meadow turf. To demonstrate the importance of rainwater harvesting, a rain chain directs water from the crofter’s hut roof into the well, forming a reservoir that can then be accessed in a time of drought. Other features that encourage water efficiency include; the use of gravel to enable water absorption and a small hill which encourages water to drain off naturally into the surrounding areas. 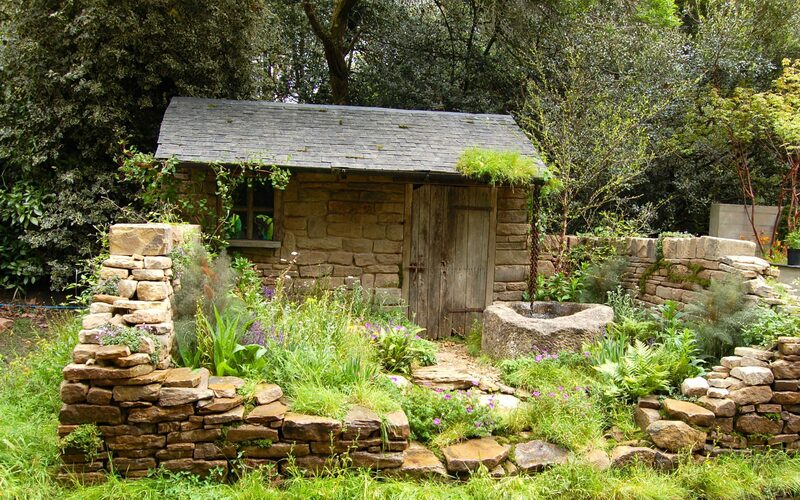 The garden can still be viewed at Capel Manor where it was relocated following the RHS Chelsea Flower Show. Designed by Vicky Harris, Built by Cube 1994.